Urban Renewal in the Heart of Eugene. Retreat yourself with massages, facials, manicures and pedicures to detoxifying body wraps, salt scrubs, hot stone massage, and essential oil treatments. Car Accidents are scary and unsettling. Whether a fender bender or a major collision, car accidents can trigger a whole host of emotions. My son and I had what I have been calling a "medium car accident." "Medium," because no one was critically injured. "Medium," because our car was totaled and smashed real good, and I sustained "Whiplash" (sprains and strains of the spine, rib attachments, and hip joints), smashed elbows, and my son and I were extremely shaken up. I was in serious shock for 24 hrs, and still had pretty serious "brain fog" (difficulty focusing and reading) for about 2 weeks. I was very sensitive and worked up. My son was luckily O.K. He, too, had been shaken up and rattled by the crash. He was obsessed with wanting to look at the car and talk about the crash. He was irritable and extra sensitive (he is 3....lots of big feelings) for a week. This event left me sore and upset. It reminded me how little we can control.....Then, I felt really grateful! 1) Go to Urgent Care or see your doctor as soon as possible. If you are injured, even if it seems like just a little bit, a once-over by a doctor or nurse practitioner is not a bad idea. Many times someone can have a concussion and have no idea! Often we are not totally aware of what exactly happened to our body during a collision. We're a little preoccupied by trying to stay safe to notice if maybe we hit our head...or possibly have a minor break. Often, you can apply the cost of the visit to your claim, even if you go before you receive a claim number. Make sure the office knows it's due to an auto accident. They can help! 2) Seek out a Chiropractor. "Whiplash" A.K.A. Sprains and Strains of the neck, spine, hips, arms, legs, jaw, ect., are very common injuries after a car accident. At first I was in shock but as the day went on my hips and neck and ribs felt awful. You may not fully know how injured you are for a few days...possibly even up to 6 weeks. Having a good advocate who can help you is key! 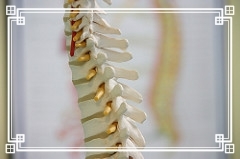 A chiro can directly help reset the body by aligning joints, which can lessen pain, help restore range of motion to the body and help reset the brain-body connection back to "normal." Chiropractors are also great resources because they can be a hub for referrals! Insurance likes you to be under a doctor's care and to have a doctor's referral to do most anything....and A Chiro Is A Doc! Yay! Obviously keep in good contact with your insurance to be sure that all services will be covered. Dot those I's and cross those T's when it comes to insurance...Don't assume. Usually, insurance is good about helping. At your first Chiro appt, you can talk to them about a massage referral, and a physical therapy referral for down the road. With referral and claim information in hand, you have what you need to find a Licensed Massage Therapist (LMT). Up front, let whomever you're talking to know this treatment is related to an auto accident. Many LMT's, clinics, and even our Pearl Day Spa, can bill an auto claim for treatment. Massage is a wonderful and supportive way to heal form a motor vehicle accident, though I may be biased as I am an LMT of almost 13 years. I have personally aided many clients through auto accident injuries. Massage helps restore range of motion, reduce inflammation, soothe the autonomic nervous system, support joints staying aligned, and is a supportive place to feel safe and validated while you're healing and possibly feeling vulnerable. I have been receiving great care from a friend whom I work with at the spa. She has really helped my hip specifically. Over time she has helped all the muscles to calm down, loosen up, and helped my pelvis to remain aligned. If, as you heal, your notice you're still not quite getting over the hump, physical therapy may be in the cards. 4) Seeking out a Physical Therapist. Once again, have that claim number and referral ready. And once again, make sure they know this is due to a motor vehicle accident. Then let the PT do their magic! I have yet to see my PT. I have an upcoming sequence of appointments set up and am looking forward to all of them! PT offers something really amazing. PT is another way to support the mind/body connection. Often after an accident, weakness or over firing (over compensating) can occur in certain muscle groups. This can in turn cause imbalance and pain throughout the body. A well-trained PT has the training to muscle test. This allows them to see what muscles are not doing their job, or which muscles are overworking themselves. After they take you through many muscle tests, stretches (such as having you flex your bicep with a little resistance or isolating the hamstrings to see how they are or are not working) then the real work begins. The PT gives you very special exercises and or stretches that continue to support joint stability, alignment, reduce pain (though, through PT you may have some soreness in the beginning), and increase strength. ICE! ICE! ICE! And Rest! It's easy to get impatient and feel like, "Hey! I'm busy! I don't have time to slow down and rest..." But let me say, Yes You Can! And your body will thank you for showing it a little grace while it's healing. In fact, proper rest from exercise and house work...for a few weeks...and a good icing routine can expedite healing and support the work you're seeking out. Allow those adjustments and massage time to do their job. I fully understand how difficult this can be. I'm a busy working mama...lyin' low is a challenge for me. But, I took 3 weeks off from the gym (Not easy for me!) and let some house work take a back seat while I let myself rest...and even squeezed in a few naps. Let me say, it Made A Huge Difference! I, of course, hope you are never in an auto accident, but if you or someone you know has the unfotunate luck of getting into one, I hope these tips can help you or your loved one heal faster, feel better, and help you to feel more informed and empowered with your care. Seasons Change-- Shouldn't Your Skincare? Stressed About Your First Visit to the Spa? Don't Be! Stressed Out? Try "Forest Bathing"
Posted on January 5, 2018 by Lily Lunnemann and filed under Self-care, Massage & Bodywork and tagged massage car motor vehicle accident physical therapy massage therapy.